History was never my favorite subject but I blame it on the lousy and uninspiring teachers I had. However, as I travelled more, and the older I got, the more fascinated I found history to be. Now I'm learning about American history and this book was a fabulous introduction to the history of the American West and the diverse Native American tribes. Author Michael Blake, who wrote "Dances With Wolves", has written an easy to comprehend, and follow, history book on the brutal slaughter of so many people, on both sides. 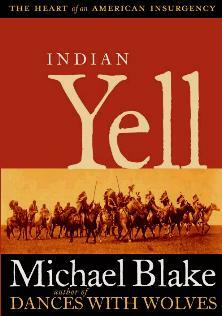 It's a concise account of battles involving among others, General Custer, General Sheridan, Chochise, Sitting Bull, Geronimo, and Crazy Horse. Names we're familiar with, and in my case, didn't know much about, now all make more sense. While atrocities happened in both camps, Blake's account is not sick-making - it's enlightening and the book is hard to put down. Never thought I'd say that about a book on history! Even more meaningful for me is that it all happened in and around Colorado, where I am based. Names and places now have more relevance. The disturbing and sad part was how people were herded onto reservations, their spiritual legacy disrespected, and a mockery made of their heritage. The book is short, sweet, and to the point. Read my review of another book by Mr. Blake, Twelve the King. Conclusion - I highly recommend this eloquent account of American history.